Sanjeev Kapoor needs no introduction. Sounds clichéd. But that is the truth. The million dollar smile that radiates from his face and has earned more than millions of fans worldwide (I wouldn’t be surprised if the figure touches a billion in India!) cannot be the only reason. A celebrity Chef, TV Show host (Khana Khazana, his cookery show on television was telecast non stop for more than 17 years! ), author of many best-selling Cookbooks, National Award winner for ‘Best Chef of the Year 2008’, co-owner of India’s first 24 Hour Food Lifestyle Channel, Entrepreneur… the reasons are many. Talking to the man himself as OPTIONS By Sanjeev Kapoor opened it’s second restaurant yesterday in The Mövenpick Hotel Deira, the one thing that I learnt from him amongst many others – never leave behind your humility, good behavior and your smile at home when you meet people. This man has single-handedly changed the Indian mindset in making the Chef’s profession fashionable and probably the most sought-after profession. An incredible feat in a land where till now the most revered professions had been Doctors, Engineers, MBAs and Civil Servants. Most Indian Chefs that I have had the opportunity to meet, acknowledges this hands-down (The Bohemian Chef too agrees). Our conversation starts off taking a cue from here. You’ve given the designation of ‘Chef’ a lot of credibility in India and have made the profession fashionable. How do you think you did that? Was there at all an intention like that – to change the mindset? I was not a typical Chef. When I started, I didn’t know what a Chef is, who a Chef was or how the entire thing works. No one in our family or friends’ circle or in our neighborhood was a Chef. It’s not that I had a passion for it. The only criterion was – it had to be something creative and something different. It could have been anything and I would have done that. Then why not something else? Why Chef? Initially, I thought that I would do Architecture – it fitted all criterion. Then somehow I got introduced to this field and I thought ‘Oh my God! This is very different’. That was the motivation. It’s like how you quit your job and started your blog (yes, I had already told him how I wanted to spend my lifetime writing on Food and Travel). Did anyone do any arm-twisting? No. That was your choice. Did you know that you would start writing a blog? Or when or how you’ll start? (I told him – yes, I knew I wanted to write on travel & food, that’s it!) But did you know when you’ll start? In my case, I was certain that I wanted to do something creative. Fortunately, my parents were very supportive. Today, I’m supportive of whatever my two daughters want to do. One is studying Law and the other is a National level athlete. So, people often wonder whether that bothers me and they ask me – ‘Isn’t it good to have someone from the family to manage your business?’ No, it doesn’t. I’m happy for my daughters. They are doing what they want to. I can always hire people to manage my business. But I cannot give my daughters what they want if I don’t give them that opportunity. I don’t want to take that choice away from them. Since I was very different, I started doing things differently. One of the first things that I realised when I started working in the kitchen was – the Chefs were not teaching. It was a pain to be in a kitchen when I started. The Chef’s cooks had the skills but they were not educated. Moreover, the Chefs felt insecured to train anyone else (The Mummy syndrome, I said!). It was very frustrating. If you wanted to know something, you had to learn and you had to learn it very very fast. So I asked myself what I could do? Well, this is what I can do. For me it’s going to be difficult to learn. But as soon as I learn something, I’ll teach something. I started this right from my first job. As a trainee I started to train. This started creating opportunities. At that time, I didn’t know that what I did would eventually turn out to be what I am doing now. So it all started because I decided to share my knowledge. Sharing has been the key to your success as a Chef and an Entrepreneur. Right now you’re both. If you were to choose between the two which one would you choose, assuming you were starting all over again? Any skill that you have – for example cooking – one you cook to earn and the other you cook to feed. As a Chef when you work and cook, it is to earn. And while you cook it pleases you. And when you are getting paid, you are already an Entrepreneur. If you are working in any job and you don’t start thinking like an entrepreneur, don’t work! My first job outside India was in New Zealand. I opened an Indian restaurant for someone. Within 6 months I realised that right next door, a restaurant space was available. Economy was down. I told the owner of the restaurant which I set up – let’s rent the other one. We’ll use the same kitchen and I’ll manage the cooking for both at an increased wage of 500$ while he only had to invest in the interiors. Suddenly, I was thinking for him, I was thinking as an entrepreneur and I was also working as a Chef. No matter what you do, if that is being done to earn, you are already an entrepreneur. It’s not either/or. Khana Khazana broke the entire mindset of Indian people. It has been one of the longest running show of its kind in Asia, broadcasting in 120 countries and having more than 500 million viewers. You have your own Food Channel. What would be the next level of aspiration for Sanjeev Kapoor? (Laughs) Not many people realise that I’m always doing something new. I feel there’s so much that needs to be done and there’s so much one can do. My dad had said something that has struck me forever – You don’t know what you are doing. In India, the power of cooking has never been understood. You are giving this power to women which they already have but only now can be celebrated. This is in some sense, emancipation of women. And that is your contribution. I felt that these words were too powerful and I thought if this was the change that I have brought about, then I haven’t changed the way people look at Chefs but actually I have changed the way people look at women. So I thought that I have to do more. I started a company where we train women to cook. These women in turn trains her circle of friends. But what is the motivation? I may be charged and motivated. But to motivate these women, you have to bring in money into the system. So, we have created a model where we have almost 500 kitchen products and these products are embedded in our training programmes. It’s simple at one level, complex at another level and also commercial. Today we have over 15,000 such franchises. These are women who love to cook and are happy to earn. I know so many women who are making Papads, Pickles and so many other food items to sell. Now they are getting an opportunity to to earn in an organised way. That’s true. The feminine touch will probably bring back all your nostalgia related to your mother’s cooking. Each restaurant has it’s own concept and idea. 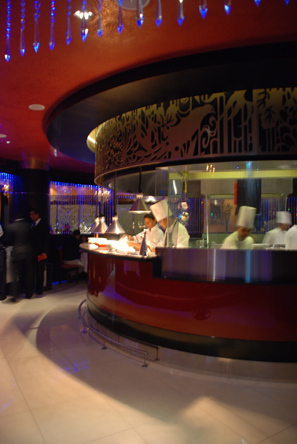 OPTIONS will be making sure that the diners get the best of Indian Cuisine cooked in the most traditional way. The ‘Live’ cooking in the middle of the Restaurant is going to be exciting for sure. Diners will anticipate for the Food as they see it being cooked, out in the open. You can see the food being cooked, interact with the Chefs as well. 1) Which food can catch on as the next Indian food trend apart from Butter Chicken, Chicken Tikka & Chicken Tandoori? (No offense meant to my British friends but aren’t we a bit overfed with these three?) (Laughs) Actually, now people are getting used to more regional dishes, specially South Indian food. I barge in – this is one thing that upsets me – Indian food means either North Indian food or South Indian snacks – Idli and Dosas… nothing in between. So it is the people from those region who have to take pride in their own food and come forward. I barge in again – So there’s scope for a Bengali food blogger to come forward to the rescue? Of-course, hundred percent! 2) As a Food blogger I always feel inadequate when I write posts that cannot provide solutions or relate to the many food problems in the world. As in – more people in the world die of hunger or health related diseases rather than violence, accidents or natural disasters. Do you think that it’s the restaurant or the food industry’s responsibility to educate people or should that be left to individual choices? The restaurants should inform but at the end, this has to be left to individual choices. There are ‘healthy menu options’. But what if the entire Menu is revamped and recreated in a healthy way? Even today when people go out to eat, the primary reason is to taste. Eating out is a social outlet where people want to be happy. Unfortunately, the common perception of healthier food is equal to boring food. The trend is changing though. More healthy options are entering the restaurant Menu. It can be healthier not just healthy. But it will take time. Till then information is important. It’s difficult but not impossible. For example, 15 years ago, when I started my first restaurant in Dubai, we had started making Bran Naans (Indian Flatbreads) and started cooking with Olive Oil. Within 3 months we had to change as no one was ordering them. Even today, the Kaali Daal or the Black Daal has to be with the Makhan/Butter and Cream. Everyone knows Yellow Daal is lighter and healthier but people prefer to order Kaali Daal when they dine out! Do you read Food Blogs? Do you think that they have some responsibility? Or, do you think this way – we already had food critiques, why again Food Bloggers? Finally, my wait was over and I met MasterChef Sanjeev Kapoor. I had attended the soft launch of OPTIONS Deira a few days back and was eagerly anticipating it’s official launch (Pictures on my Facebook Page – Soft Launch and Official Launch). This restaurant was not going to be different from the one that is located in the Dubai World Trade Centre (DWTC), where I had attended RannaGhar, the Bengali Food Festival. As Mr Md. Sayed Hussain, the Chairman, said – ‘When you are dining in the Deira restaurant you shouldn’t feel that anything is less than the one in DWTC. The decor, the service, the food – everything should be at par. In-fact, the diners should feel that yes, they are indeed eating in the same award-winning restaurant as OPTIONS in DWTC’. OPTIONS by Sanjeev Kapoor, DWTC has just won the Masala Award for the Best Asian Restaurant. Congratulations to the OPTIONS team and the man himself! Okay, so I met the smiling, ever ebullient Mr Charm himself. His smile is intoxicating. So is his energy level. But who got to keep his signed autograph? My Mum-in-law! She’s been a major fan and has been writing down each and every recipe that has been shown in Khana Khazana! There’s also something in store for you. Stay tuned for the next post which is going to be exclusively on the newly opened restaurant and for which 2 couples will be winning dinner vouchers! Disclaimer: This interview got published in Sanjeev Kapoor’s website as well. Please do not use any material from this post. I hope you enjoy reading the posts with lots of visuals. While you enjoy seeing them, please don’t use them as some of them have been taken from our personal albums just to make your reading experience more pleasurable. You can see more pictures of my travel and food journey here. ← Bohemian Restaurant In Kolkata | Chef Joy Talks About Food That Does Cabaret On The Senses! Please don’t be…. BTW, you could win a chance to win a couple invite to dine in OPTIONS Deira. Just look out for my next post! Congratulations on getting to interview ‘The Chef’. Very rightly put…he has change the perception of ‘Chef’s’ all over…esp in India and Indian minds! The quintessential ‘Ranna’r lok’ has been put on a pedestal because of him. Great work, great achievement….the man and the lady who has interviewed him. Proud of you Ishita. great write up. love d last 2 pics……wow!!! Thank you Vidhya… the autograph for my Mum-in-law, cute – isn’t it? It was really good interview with Sanjeev Kapoor chottuli. it was well done. Thanks you so much Mashi… it was quite an amazing experience for sure! Really enjoyed this. You brought out his talent, energy and personality in a lovely manner. Thank Wendy, you are being too kind to me. Yes, I didn’t probably want to know the standard answers which can be googled anyway or come out on papers. For me how he achieved what he has achieved – if that transfuses to the readers as inspiration, my objective would have been achieved. Inspiring!! How simply enjoyable one’s life is when passion to create takes over. How easy it is that we forget that simple fact every second of our life. Loved this interview! Always admired his recipe but now I know who he is ….. So I thank you both. What a warm and wonderful gentleman! And you are going to be the favorite daughter-in-law after this. 🙂 Good job on the autograph! Hey Stacy! I guess I missed out this comment of yours. You bet I’ve become the fav daughter-in-law! a great experience indeed…..n inspiring too….I too .am a great fan of him…..
My favourite part was his father’s words to him. Words are such a powerful thing, his dad gave him a life full of support, encouragement and motivation in a few sentences. Getting a compliment like that from one’s own parents can make so many things worth it. Oh Absolutely! If parents can support a child’s dream – what else do we need? With hummus pita bread is served, but right now I don’t have pita bread, then what else can be served. Tahini dip can be served with what. 2. If I am already signed for newsletter then why all the the mails which u have sent, then why the recipe says click web page If u can’t open recipe page. And if I do that then it says click on contact us or return to home page. 3. Right now when I sign to newsletter or subscribe it says u r already signed in. If I am signed in then why I am not recieving the newsletter on my gmail. Hi Rupali… You can use Naans or Papads too. Also, Tahini dip, you may use it for Pakodas and other fried fritters. Well, I do not yet have a newsletter… you are supposed to be getting a new post by email. Have you subscribed to my blog via email? hire a contractor who provides a variety of styles and trimming and fascia. Cappello allegedly obtained bid and the roof.